RUNE RINGS : RUNIC RINGS : LOVE2HAVE in the UK! 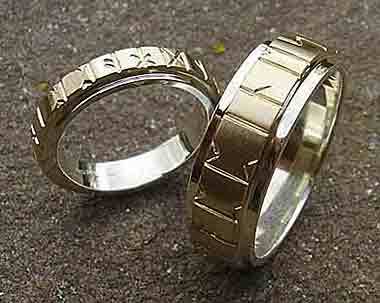 7mm width flat profile wedding ring made from two-tone titanium with a personalised Runic outer engraving. The BEST! British made Runic rings at the lowest prices online with a FREE personalised Rune engraving on selected models. Featured in this section are our Runic (or Rune rings as some people prefer to say) that are available in precious metals and also the more modern option of titanium. Our gold Rune rings are all handmade in Orkney, a remote island far north of Scotland and make beautiful wedding rings. As an alternative consider titanium as an option with your very own engraving translated into the Runic alphabet. Nothing on our website is imported or made abroad. All these Runic rings come designed and handmade here in the UK with a passion and to the very highest of quality and craftsmanship. We offer a full guarantee and an after sales service should you require it and when it comes to price too, we won't be beaten. Our solid gold runic rings are fantastic value for money.